Thank you for your interest in applying to Hampshire College! Our Board of Trustees has voted to pause enrollment for the fall of 2019. In accordance with this vote we have suspended and withdrawn all applications for 2019. Thank you for your understanding and patience during this time of change. Stay tuned for more information about the 2020 application process. We are committed to making Hampshire affordable for you and your family. At Hampshire, we accept the brightest, most creative, and passionate students, regardless of their ability to pay. Hampshire's commitment to financial aid is stronger than ever, with $30 million dedicated to funding our grant and scholarship programs for new and returning students. For some students, Hampshire is more affordable than a public institution. Aid policies vary among colleges, and only by applying can you evaluate whether our offer will work for you. We cannot emphasize enough the importance of applying for admission and applying for financial aid at the same time. Some more recent statistics can be found on the Hampshire at a Glance page. Need-based financial aid awards are determined using an institutional methodology employed by many private colleges and universities. Financial Need is the Cost of Attendance minus the Expected Family Contribution (EFC). To estimate your family's contribution and your actual cost, use the Net Price Calculator. Hampshire offers several merit-based and matching scholarships. These renewable annual merit scholarships range up to $15,000/year for four years. All merit-based scholarships are awarded by the admissions committee with no separate application required. Please visit our financial aid page to learn more about the financial aid process, financial aid application due dates, required forms, online links, and how to contact us if you have any questions. 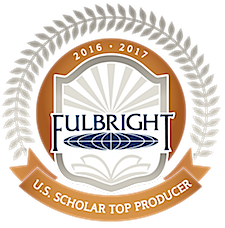 The U.S. State Department and the Chronicle of Higher Education have named Hampshire College a top producer of Fulbright Scholars for 2016-17. Hampshire is one of 11 bachelor’s institutions to receive the designation this year. "There are two reasons why Hampshire graduates achieve so much. One is the kind of person the college attracts. The other is what the college does for them by equipping them to become their own wide-ranging explorers and connection-seekers." Hampshire College is a member of Colleges that Change Lives, a non-profit organization dedicated to the advancement and support of a student-centered college search process. We are committed to making Hampshire affordable to you. Learn more about the steps to applying for financial aid.